Do not ride your bicycle inside Eastleigh Jobcentre. Figures issued by the Office for National Statistics show the number of people claiming Job Seekers Allowance in Eastleigh jumped 5.7% in the last quarter to reach it’s highest level since 1996. 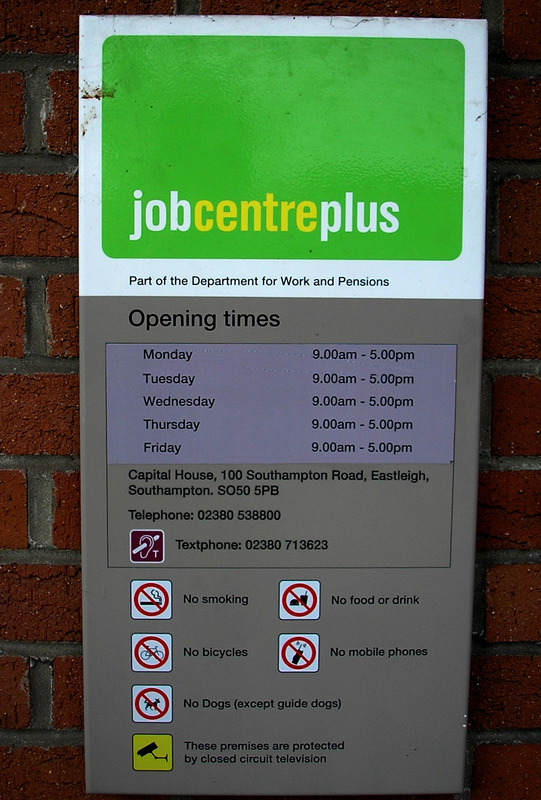 Meanwhile during the same period the number of vacancies available at Eastleigh’s Jobcentre fell 58%. In January there were a total of just 293 vacancies at the Southampton Road office, considerably lower than the 1160 vacancies that were on offer in October 2007 when the last boom peaked. This is despite the recent 40 jobs created by Poundland and the 400 rail jobs created by the Daily Echo. Shock figures released last month also showed the number of empty business premises in the town centre had increased by 26% year on year. The increase in the jobless headcount now brings the total of people claiming Unemployment benefit locally to 1900. With nearly 2000 of Eastleigh’s Townsfolk now struggling to manage on £64.30 dole money per week, the council are still pressing ahead with their plans to build a luxury Hotel which they claim will create a much needed 200 extra jobs. As the cost of the project is £32 million, this will equate to £160,00 per job. The Tories implemented every EU GLOBALIST Procurement Directive they could over the 18 years they were in office. This made them very rich and cost Britain MILLIONS of manufacturing jobs. So to reassure us, Maggie Thatcher said we could run Britain as a “SERVICE NATION”. Hah! Well NOW this suicidal policy of exchanging our manufacturing jobs for nothing more than cheap foreign goods is finally catching up with us, except that people still don’t get it…yet! But they will! Britain’s only hope is to leave the EU and rebuild its industrial base at the expense of Europe.